“Everyone says the war is over but it is hard to believe,” Leo Alvin Ihli wrote in his diary on Nov. 12, 1918. The Great War had been raging since 1914. The Central Powers of Germany, Austria-Hungary and the Ottoman Empire were pitted against the Allied Powers of Great Britain, France, Russia, Italy and Japan. On April 6, 1917, the U.S. Congress passed a resolution declaring a state of war to exist between the United States and the German Empire. Ihli from Pierre and Ernest Roth from Columbia both served in the U.S. Army during the First World War. Their war diaries, contained in the South Dakota State Historical Society – State Archives, provide insights into war. To read the diaries online, visit the South Dakota Digital Archives. The two South Dakotans arrived in France in January 1918. World War I saw an introduction of modern weaponry such as machine guns, tanks and chemical weapons. Roth wrote of another of the horrors of war: trench warfare, in which opposing armed forces dug deep trenches in the ground as a defense against the enemy. In a later diary entry, Roth describes how he and another soldier placed sticks and other debris in the bottom four inches of their foxhole to keep from lying in water that seeped in from rain. Standing in cold water for long periods of time could cause trench foot. Many trenches also had pests such as rats and lice living in them. Roth’s company fought in the front lines in one of the major battles of the war, at Chateau-Thierry. “Our ammunition supply ran short at 7 a.m. and I was sent back to find and bring up the ammunition carte. This proved to be a great game of alternately running and ducking into shell holes to avoid being hit by the buzzing enemy bullets. Have had no food for three days and only water from contaminated creeks to drink,” Roth wrote about the late July battle. Roth encountered a gas attack and was sent to a field hospital. He rejoined his company on Sept. 1. Many of Ihli’s diary entries focused on taking care of horses. At the start of the war, horses were used for cavalry. A mounted cavalry proved impractical because of trenches, barbed wire and machine gun and artillery fire. Armies on both sides relied on horses and mules to move ammunition, supplies, ambulances, weapons carts, artillery pieces and for riding. In August, Ihli and another soldier were given jobs as mounted messengers. Ihli rode to and from gun positions, battalion headquarters and guided ration wagons. Cognac, the horse assigned to him, was wounded twice while hauling ammunition and had to be put down by the veterinary doctor. It was as difficult to get rations for horses as it was for soldiers. By the end of October, there were rumors of peace. Roth wrote that Turkey surrendered to the Allies on Oct. 31, followed by Austria-Hungary’s unconditional surrender on Nov. 4. “The French in this vicinity are ringing bells and blowing horns to celebrate the occasion,” he wrote on Nov. 4. 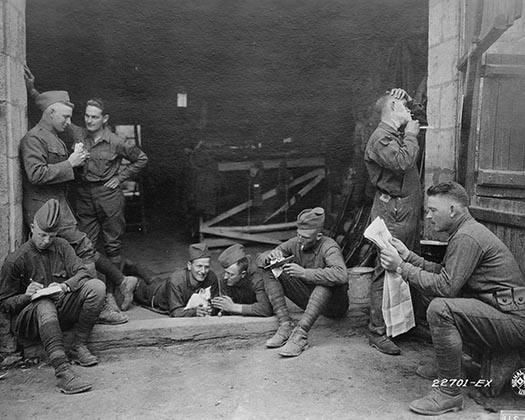 World War I took the lives of more than 9 million soldiers; 21 million more were wounded. Civilian casualties caused indirectly by the war numbered nearly 10 million. One account states that more than 8 million horses died on all sides on the Western Front. According to the South Dakota Department of Veterans Affairs, 32,791 soldiers, sailors and Marines served in World War I. A total of 554 South Dakotans died overseas from wounds, disease and other causes. A digital display called “The World Remembers” is in the lobby of the Cultural Heritage Center in Pierre through Nov. 11, showing the names of World War I soldiers from all countries killed in 1918 and official war-related deaths from 1919-1922. The display also includes a list of South Dakota soldiers killed in the war. The Cultural Heritage Center’s education room contains a display of photographs from World War I from the photo collection of the South Dakota State Historical Society – State Archives.